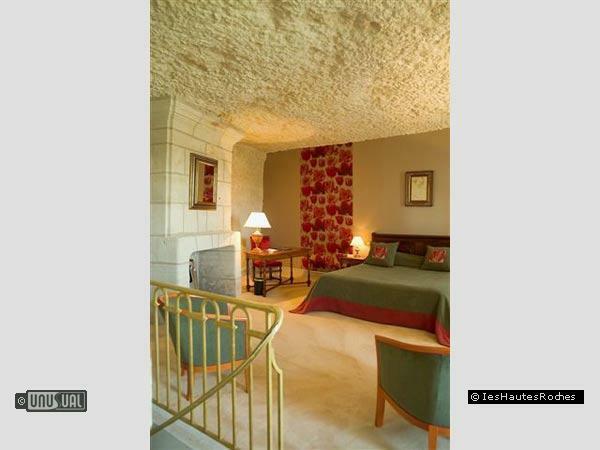 Beautiful rooms carved in the rock in this underground French hotel. 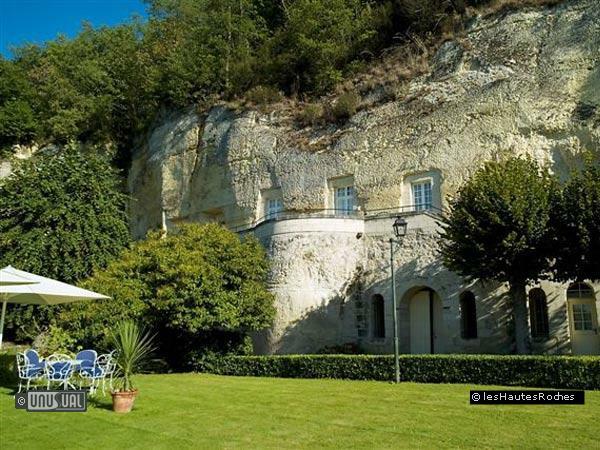 With twelve rooms carved out of the limestone rockface and a gourmet restaurant, Domaine des Hautes Roches opened its doors to guests in 1989. 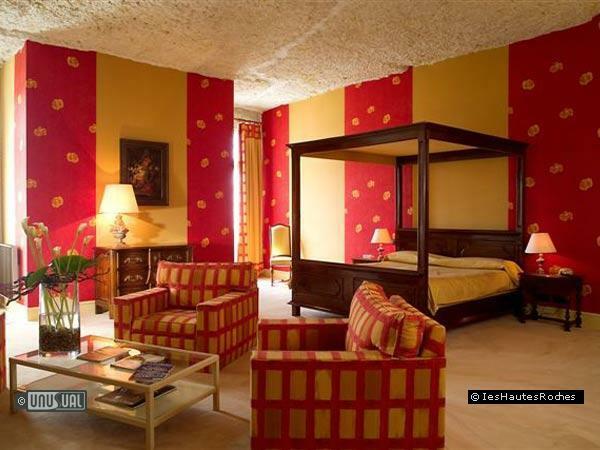 Formerly inhabited by the monks of the nearby Abbey of Marmoutier, they were renovated over the course of eighteen months by owner Phillipe Mollard to become the first troglodyte hotel in France. These once-abandoned-caves and adjoining seventeenth-century pavilion had lain dormant for nearly fifteen years. Now Les Hautes Roches represents a historic and sensible base from which to visit the most famous chateaux of the Loire Valley. 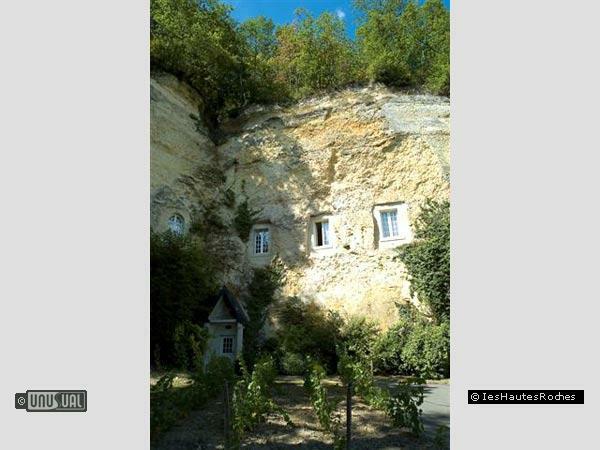 The caves themselves were dug out to quarry the light-coloured stone used to build some of the most famous chateaux of the surrounding area and become monk refuges during the war of religion. Uses on occasion for growing mushrooms as well as for ageing wine, from 1855 to 1975, the Domaine des Pentes was among the finest wine-producing properties of the Vouvray region, serving as a storage area for a company dealing in spirits. 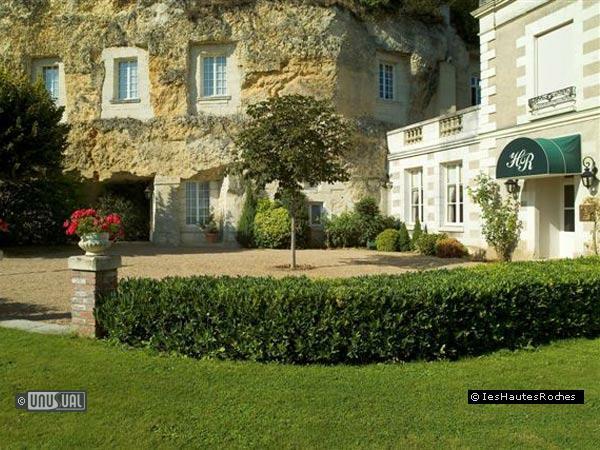 The hotel has twelve rooms in caves, plus three rooms in the pavilion building. 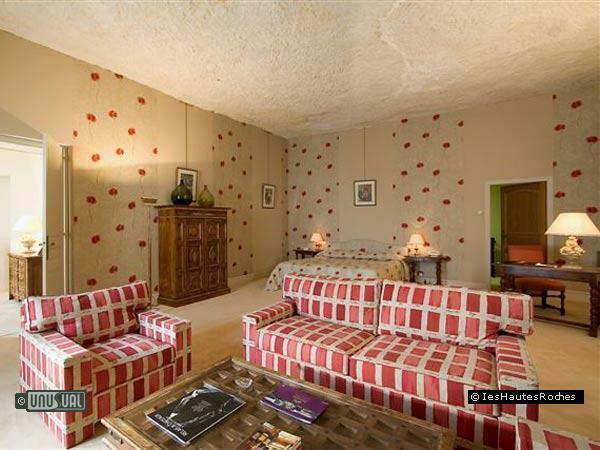 The cave rooms themselves are not cut so deeply into the cliff face to be claustrophobic and benefit from large windows that bring light and an unobstructed view of the Loire opposite. While the cave rooms lack air-conditioning, during summer months, they remain fairly cool, especially if curtains are drawn during the hottest part of the day. As the hotel faces the RN152, those expecting to open the windows for ventilation maybe disappointed if they also wish for absolute peace and quite, as the road can be busy. Outside there are a number of grassed terraces and an open-air pool available for guest use in the high-season months. The restaurant has received many excellent reviews and is situated in the small manor house, with large windows opening onto the river. Chef Didier Edon has been with the hotel for over ten years and offers high quality gourmet cooking, specializing in seafood. Closed Mondays. 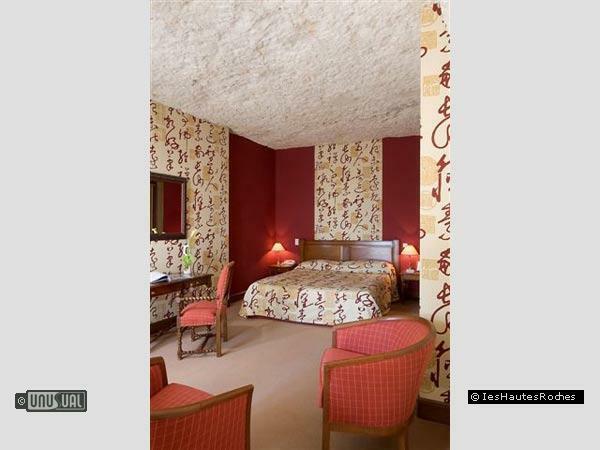 The hotel is on the outskirts of Rochecarbon which falls into the "appellation contrôlée" of the great wines of Vouvray. The historic city of Tours is only 8 km (5 miles) to the west. The Loire Valley is famous for castles and wine and both are within easy reach of the hotel. The great chateaux at Chenonceau, Blois, Cheverny, Azayle-Rideau, Chambord, Claumont and Amboise are all within a radius of 60 km (40 miles). We especially recommend the chateau of Villandry, 35 minutes away by car, for its world renowned formal gardens. 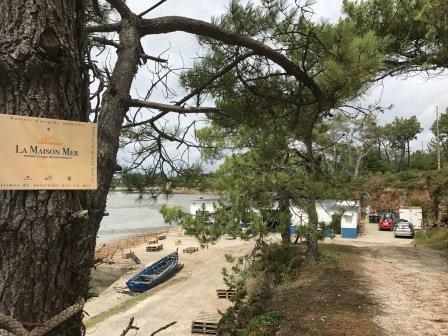 Guests might also be interested to join a Loire boat excursion that can be booked by the hotel, lasting around 45 minutes with commentary. Our very own Princess Roxy was on hand to view the i360 Observation tower in Brighton. They're running a great Mothers Day promotion at the moment with drinks, brunch or afternoon tea. As you glide up gently in the glass viewing pod, treating her to a glass of Nyetimber sparkling wine from the Sky Bar on board, and she'll receive a free bunch of daffodils to celebrate. During October and November*, No Man's Fort is offering overnight stays from £249 per room. That's £124.50 per person! This cost includes a welcome drink, historical fort tour, a sumptuous three course dinner, bed and breakfast and return boat transfers from Gunwharf Quays.